Gabapentin is a GABA analogue. It was originally developed for the treatment of epilepsy, and currently, gabapentin is widely used to relieve pain, especially neuropathic pain. Gabapentin inhibits the central L-type calcium channels situated on the axon terminal and reduces the hyperactivated neurotransmitter release. Gabapentin relieves the severe pain associated with neuropathy. Methylcobalamin is the neurologically active form of vitamin B12, which increases Myelin sheath formation and regenerates neurons. 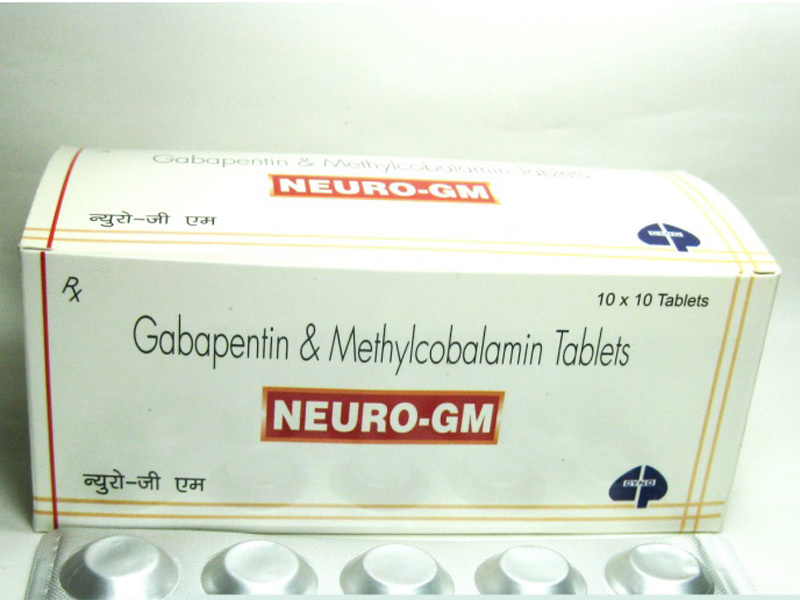 Gabapentin is structurally related to the neurotransmitter GABA but is neither a GABA agonist nor antagonist. Gabapentin-binding sites have been identified throughout the brain tissues e.g. neocortex and hippocampus. However, the exact mechanism of action is still unknown. Absorption: 50-60% absorbed (oral); peak plasma concentrations after 2 hours. Distribution: Widely distributed; enters breast milk. Protein-binding: Minimal. Excretion: Urine and faeces; 5-7 hr (elimination half-life). Strictly follow all instructions provided to you by your physician or pharmacist while using Neuro-GM (Methylcobalamin/Gabapentin). Optimum and safe dosage can differ based on the patient and the condition being treated. Somnolence, dizziness, ataxia, weakness, paraesthesia, fatigue, headache; nystagmus, diplopia; nausea, vomiting, wt gain, dyspepsia; rhinitis; tremor; leucopenia; altered LFTs; Stevens-Johnson syndrome. Gabapentin should not be discontinued abruptly after long term use. Abrupt or over rapid withdrawal may provoke a withdrawal syndrome similar to alcohol or benzodiazepine withdrawal. Gradual reduction over a period of weeks or months helps minimize or prevents the withdrawal syndrome. Discontinuation or transfer from other antiepileptics, history of psychotic illness; renal impairment; pregnancy. Gradual withdrawal over at least 7 days to prevent an increase in seizure frequency. Cimetidine may reduce gabapentin clearance. Absorption reduced with antacids. Store at 25°C (77°F); excursions permitted to 15° – 30°C (59° – 86°F).